Ask people how fast the water came into New York Harbor with Hurricane Sandy, or how fast it rose, and you get a wide range of answers. Many people think it was like a tsunami that came in quickly, with dangerous currents. In some cases it was violent, particularly at the beaches where waves brought it on in abrupt fronts. However, in the harbor, the waves were small and the water rose at a maximum of only 2.1 feet per hour, with maximum currents in most places below 5 miles per hour. You would need a fair amount of patience to detect water rising at 2.1 feet per hour (about an inch every two minutes) if you were to stand and watch, and it is not a dangerous rise rate if there are areas of high ground or higher levels to your home or building. Map showing the south-east shore of Staten Island, fatalities (dots), and descriptions of cause-for-death. 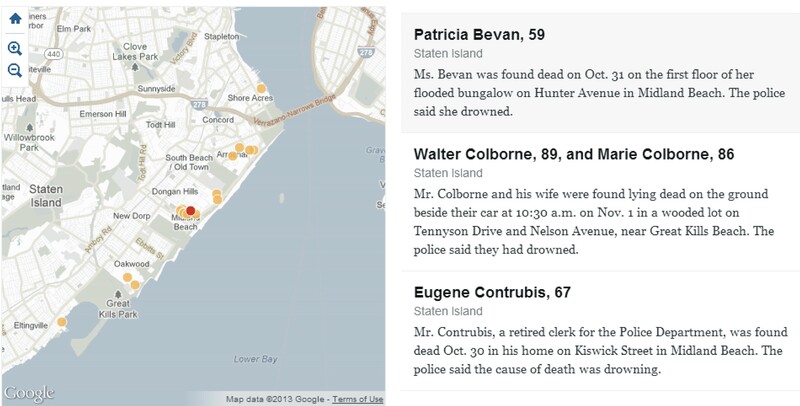 The Times map tool shows that the regions with the strongest spatial clustering of fatalities anywhere in Sandy’s path were (1) Staten Island’s southeast shore, shown above, and (2) Rockaway Beach. The square mile bounded by Midland Avenue, Father Capodanno Boulevard, Seaview Avenue and Hylan Boulevard turned out to be the most dangerous place to be in New York City the night of Sandy, in terms of deaths. It also is a topographical “bowl”: the streets are several feet below Father Capodanno Boulevard, the thoroughfare that separates the neighborhood from the Atlantic Ocean. Sandy brought with it an exceptionally high storm tide that reached almost 14 feet at Manhattan’s Battery. But it was a relatively slow-moving storm, and the water level rose gradually. Phil Orton, a research scientist at Stevens Institute of Technology in Hoboken, analyzed U.S. Geological Survey data and found that even at the peak of the storm, the water at the edge of Staten Island rose by just about 2 feet an hour. But that surge would not have reached the streets of Midland Beach until after the water exceeded the level of Father Capodanno Boulevard. Only when the water overtopped the boulevard, as it did at about 6:30 p.m. Oct. 29—the night of Sandy—would people notice it. And, while it is difficult to know exactly what led to any individual victim’s death, the rush of water appears to have caught people off guard. If you are having trouble imagining what happened, take a heavy mixing bowl from your kitchen and put it in your bathtub. Fill up the bathtub while holding down the bowl, so it doesn’t float away. The water rises gradually outside the bowl, while the inside stays dry. But once the water level reaches the lip, it will come rushing into the bowl. Once the water overtopped the shoreline berm, it filled in neighborhoods like Midland Beach with water very quickly, within tens of minutes, much like what happened in New Orleans and has since been labeled part natural disaster and part “man-made disaster”. Looking back at how this dangerous topography could have come to exist, one has to look back to the 1950s. Due to susceptibility to flooding during moderate storms, likely two severe nor’easters that occurred in 1950 and 1953, the waterfront berm was raised in the 1950s to better protect the neighborhood from flooding. This protection was good enough to stop a moderate storm surge like Hurricane Irene’s, and that recent storm likely contributed to the sense of people in this neighborhood that they were adequately protected from the ocean’s waters. Unfortunately, the insufficient level of protection also transformed Sandy’s flood rise from an inch every few minutes to 6-8 feet in a few tens of minutes, making it deadly. Building permanent walls or berms successfully reduces risk for smaller flood events, leads to temporary safety, additional development in floodplains, and eventually, complacency. However, it also dramatically raises human risks when “surprise” large events go higher than the design height of the barriers (see New Orleans). Choosing a design height for barriers becomes especially problematic when sea level rise is accelerating, as we know they are now doing. This relates to the recent term coined by Nassim Taleb, antifragile. Our great challenge is to create antifragile floodwater protections that bend but don’t break. Or put more directly, that help stop or reduce flooding, but when they fail they don’t make a more deadly hazard such as rapid-rising waters. This entry was posted in opinion, security, water, weather and tagged adaptation, berm, danger, death, Father Capodonno, flooding, hurricane, levee, Midland Beach, mortality, New York City, protection, Sandy, Schuerman, Staten Island, storm surge, superstorm, wall, WNYC. Bookmark the permalink. 4 Responses to Sandy’s Staten Island Flooding Deaths: A Man-Made Disaster? Where I live in Hoboken on Adams between 7th and 8th, it rose remarkably fast. At around 8pm I looked outside to see if flooding was occurring. There was water starting to pond at the intersection of 8th and Adams. 15 minutes later I looked out the window again and water was traveling south down the sides of the street. At that point I knocked on all of my beighbors’ doors in the building to let them know the flood was coming and to get anything out of the garage they didn’t want ruined. In the next 20 minutes the water rose another foot and flooded our first floor and garage. The waters receeded almost as fast about an hour later, but only at our location since we are mid block, at the highpoint. The intersections at 7th and Adams and 8th and Adams stayed flooded for the next 24 hours. It’s very interesting to see how topography cane into play for the flooding, as per my comment above about Hoboken. From discussions with neighbors in my parents’ lagoon neighborhood on the mainland side of the Barnegat Bay in Brick, the water rose about 4 feet in the matter of about 90 minutes, due I would assume because of the Mantokloking breaches allowing the ocean to flood the bay unimpeded.